Kumato® is truly exceptional. Try it and you will experience authentic tomato flavour. Intense and sweet. Welcome to a world of sensations all the year round. Welcome to Kumato®. The quality of Kumato® begins in the field, where growers specially selected by Syngenta tend the fruits using traditional techniques and natural methods. 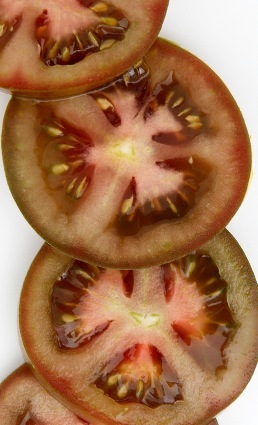 The Kumato® ripens from the inside outwards, always on the plant, and so its colour changes naturally from dark brown to golden green. The fruits it produces are juicy and firm, with high levels of fructose. Kumato® is grown in Spain, France, Belgium, Holland, Switzerland, Greece, Turkey and Canada, where the fruits ripen under optimum climatic conditions to ensure the highest fructose level and perfect firmness. The expert growers selected follow strict protocols and crop management procedures that respect the environment. As a result of rigorous quality controls from the moment they are harvested through to display at the point of sale, only the highest quality fruits are selected. All handling, packaging, storage and transport is carried out in temperature controlled hygienic environments, using methods that comply with international health standards for industrial premises (Eurepgap/BRC/IFS)is truly exceptional. Try it and you will experience authentic tomato flavour. Intense and sweet. Welcome to a world of sensations all the year round. Welcome to Kumato®.